Comedian/actor/art aficionado, Richard 'Cheech' Marin, turns 66 today. He was born July 13th, 1946 in Los Angeles California. Tommy Chong was on The Joe Rogan Experience. It was a pretty thorough, interesting three hour interview with great Cheech and Chong stories. Thank you to The Joe Rogan Experience for mentioning our site! 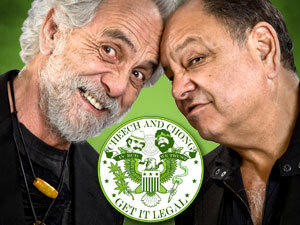 To recap...I run cheechandchong.com for over ten years with Cheech and Tommy's approval. I kept the brand alive and got each of them lots of jobs ($$$). Tommy thanks me in his book. Tommy has me email Cheech to get them to reunite. They reunited. Tommy credits me in a Philly newspaper for reuniting them. Cheech and Chong's agents, managers and most importantly, Live Nation, tell them to get the site from me. I agree if they or Live Nation agree to hire me and give me tickets to shows when they're in town. They say no. Cheech and Chong file a UDRP dispute against me for the cheechandchong.com domain, they win, they put up a really terrible site with tacky merchandise and no news. Their site is rarely updated. I create cheechandchongfans.com and still have the same traffic and same sales at this new domain. The fiasco we've been dealing with has been resolved. We've added all sorts of security measures to our PayPal account. Someone had logged into our PayPal account from Iran so PayPal limited the account. We think it's more likely that a hacker went through an unsecured server in Iran to cover their tracks. Anyhow, our store is now fully functional and secure. PayPal locked our merchant account for the next 24-48 hours because someone from Iran logged into our account. As a result, you won't be able to purchase anything until this weekend. Don't worry, no one has your account information because it's stored on PayPal's servers. Our password is unguessable so we don't know how exactly it was obtained. The person didn't take anything so that's good.